Prepotto lies at the southern edge of the Natisone Valleys, overlooking the gentle slopes of the Collio, an area with which it shares the long-standing winegrowing tradition. In the various administrative districs belonging to Prepotto, there are numerous well-kept examples of rural architecture, particularly the borough of Berda that has been restored after the 1976 earthquake taking care to respect the unity of style and environment. Historically Prepotto is very closely linked to Castelmonte. The complex that now forms the sanctuary was originally founded as a Roman post and subsequently became a fortified village. 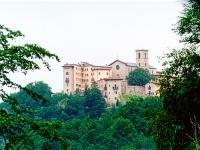 The sanctuary of the Beata Vergine del Monte was first mentioned in a document of 1175. Initially it belonged to the provost of S. Stefano in Cividale; in 1253 it was attributed to the chapter of S. Maria. In the 13th century, S. Maria in Monte was one of the most important churches in the Patriarchate of Aquileia. After a devastating fire in 1469 and an equally desastrous earthquake in 1511, in the 17th century the sanctuary was enlarged and enhanced. Eexcept for some renovation works that had become necessary after World War II, the sanctuary has not been modified significantly since then. The Castelmonte sanctuary holds some valuable works of art, including a Virgin Mary with Child (15th c.), a decorated stone statue of the school of Salzburg that is inserted in a baroque altar built in 1684 by Alessandro Tremignon. The many votive offerings are testimony to the strong religious sentiment of the local population. Among the lesser churches in this area: S. Antonio in Oborza, S. Bartolomeo Apostolo in Ciubiz, I tre Re in Prepotischis, and Ss. Pietro e Paolo in Centa.